Close to $10million is currently being invested in the Yue Lai Hotel expan­sion project on Suva’s, Bau Street. The contractor for the construction of the two new buildings is China Railway 14, while the architects are Engineered Designs Fiji Ltd.
Hotel director, FuGang Zhao said the new buildings would include a nine floor buildi­ing and seven floor building. When completed next year it will employ about 65 more staff and two new buildings. Suva businessman owned hotel is grow­ing on the site of the former iconic Noble House. Mr FuGang said the expansion project began two months ago. He said there was a lot of demand out there for accomodation and that was the reason for the expansion of the hotel. He stated that the two newly build hotel will have 84 rooms and 12 x 2 bedroom ful­ly self contained units. “All 84 rooms are deluxe rooms and we are planning to furnish the apartment units and rooms with high quality furni­ture. Mr FuGang said the location of the ho­tel was perfect because it’s a walking dis­tance to the main business hub. “The location is close to all major attrac­tion, walking distance to city, court house, museum, and a few minutes’ drive to ship­ping port, Laucala Bay sports facility and the USP. He said they were targeting locals spe­cially traveling from west for few days to do business in Suva. “We also target Fijians who are living abroad and tourist who coming to Fiji for vacation. Currently, Mr FuGang said they now employing 30 staff. The project is expected to be completed late next year. 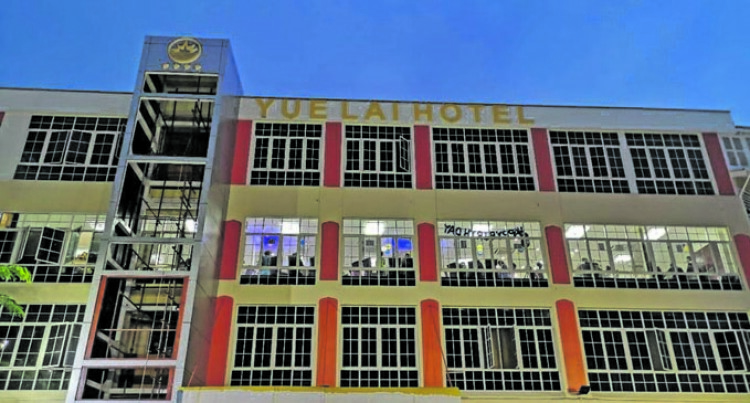 Yue Lai Hotel officially opened a class of its own two-level restaurant in Suva in 2014. Hotel staff are highly qualified. The hotel’s restaurant is opened to the public. There are six VIP restaurant rooms also available and the whole restaurant can be hired for private functions. Adjacent to the hotel is the karaoke bar which opens from 5pm to 10pm daily.